It is with a heavy heart that I write a post today. 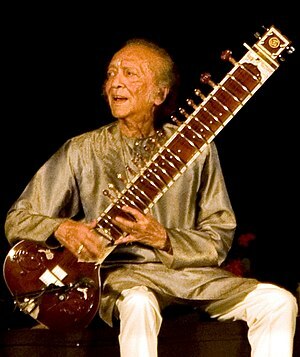 Pandit Ravi Shankar passed away yesterday at 4pm in La Jolla, CA. He was 92. The process of celebrating, honoring, and grieving a great or famous soul’s passing is a curious one. When John Lennon died, I found out with a clutch to my heart as I slowly realized the radio was playing song after Beatles song. We who listened to WNEW-FM that night listened along with –was it Vince Scelscia’s?– shock. When Michael Jackson died, so far before his time, I heard it on the radio in the car somewhere. 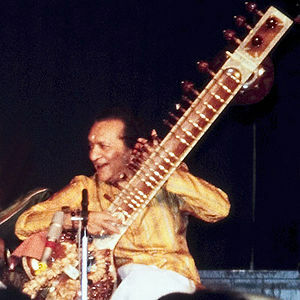 I live far from a city now, so of course, I did not hear Ravi Shankar’s sitar on the radio this morning, though I tried. All day, I went about the daily activities, including a visit to the dentist, but like the stricken character in Chekov’s story, “Misery,” to whom could I speak to of my grief? Zakir Hussein said that Panditji has gone to join the gods in heaven with whom he belongs. I suspect there are hundreds of people right now, perhaps thousands, playing his music and remembering. I was lucky enough to see him play in Boston with his daughter Anuoshka with my brother and soon-to-be sister-in-law, and I don’t think we could have clapped enough or hard. Let’s keep listening, keep clapping. He leaves us his daughters as his legacy; he leaves us his music. He leaves us wanting more.